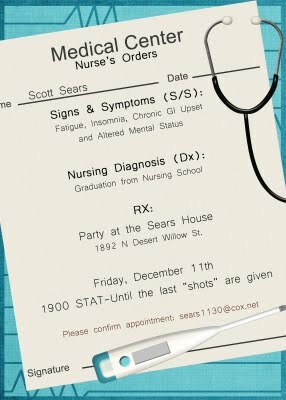 My hubs is right in the middle of his college program to become a nurse, and I think it is never too early to start thinking about the graduation party. It is that time of year when most students are graduating, so there are a lot of goodies online. 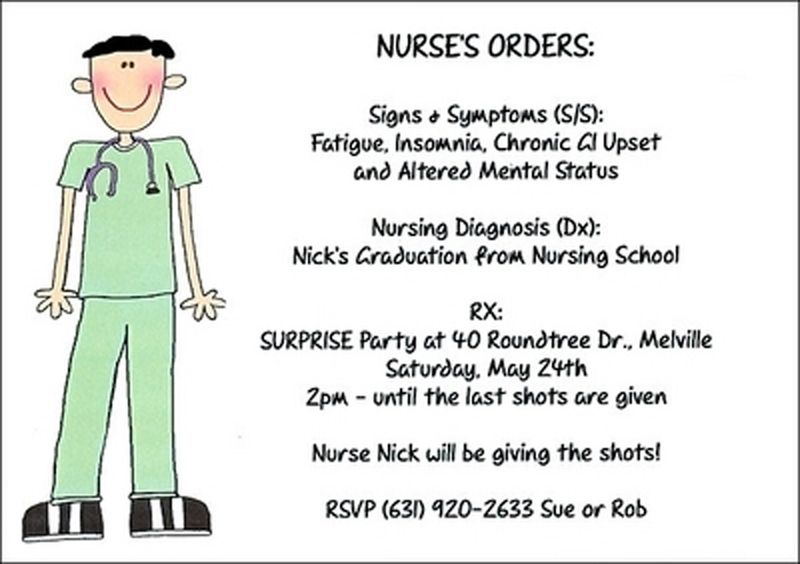 Being that he is in a field dominated by women, there are not many ideas out there for a male nurse graduation theme. This will probably progress as the time gets near, but one thing that will not change is that I do not want to go broke with all the planning. So, like everything that is cheaper, this will require a bit of work, but doing most of the things myself is rewarding. This top invitation from StationeryStudio.com happens to be completely customizable– allowing it to be for male or female, and also hosting an assortment of faces and colors. The bottom one is cute as well with similar wording. I think I will just probably use the wording from this invitation and do a more formal one. 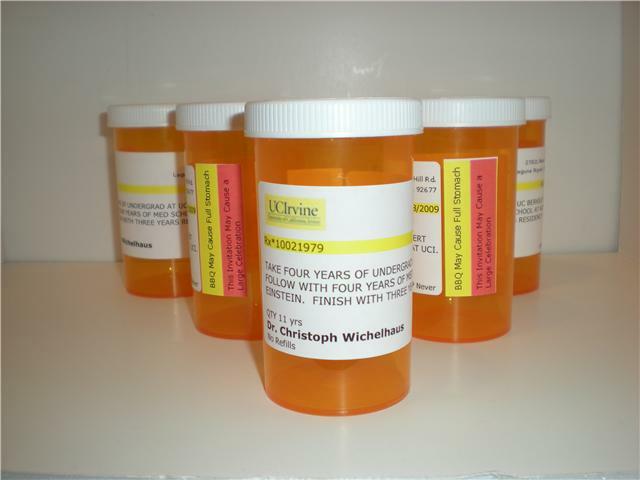 The prescription bottle one is from the internet Google image search and I think would cause some concern if you sent if through the mail, so it might be better hand delivered. I think the invitations will include the wording above, but be more like this from FineStationery.com made by Checkerboard. I want this to be a more of a formal affair as opposed to a raging kegger, so I want the decor to set the tone for the guests to abide by. 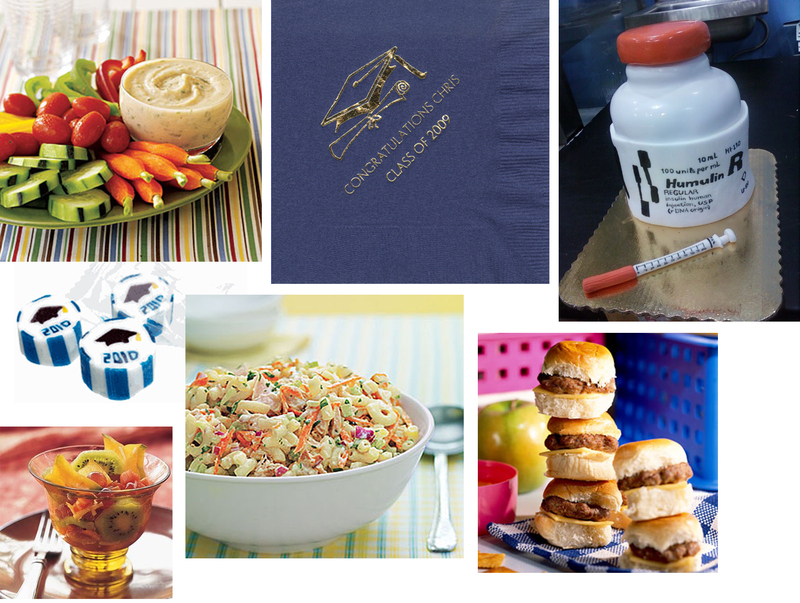 Everything shown would be tailored to his school colors and, of course, the whole nursing theme thrown in tastefully. Love the idea of creating homemade labels to adorn beers, sodas, wines, and favors from Martha Stewart. The lanterns (in the school’s colors) would be great at filling space, and they’re cheap at $13.99/dozen from Oriental Trading. IDEA: Make a stencil either with the school’s logo, or spell our ‘Congrats’ on the lanterns and light with LED Christmas lights. I like this simple glass vase adornment with a grad hat and ribbon (via sparklythings). IDEA: Buy the ribbon in the school’s colors, spray spray adhesive on the vase, and wrap the ribbon completely around the vase. Then you can either put the grad hat on it, or maybe just leave it. The cupcakes are the easiest way to bring in the nursing theme from Petit Cupcakesof London. My wedding planner proposed this idea, but I think it would work for a good keepsake for a grad party. This is from Martha Stewart, and it is simply a customized backdrop, a photo printer, and a trustworthy friend ( one who will not lose the camera or wander away) to take pictures. IDEA: If you have a IT inclined friend and a HDMI hookup, you could upload the photos directly to a projector, tv screen, or computer slideshow so people can see it and someone could also take pictures of people just being themselves. This would save you on printing the pictures out, but still would be a great keepsake that you could later share on Youtube. 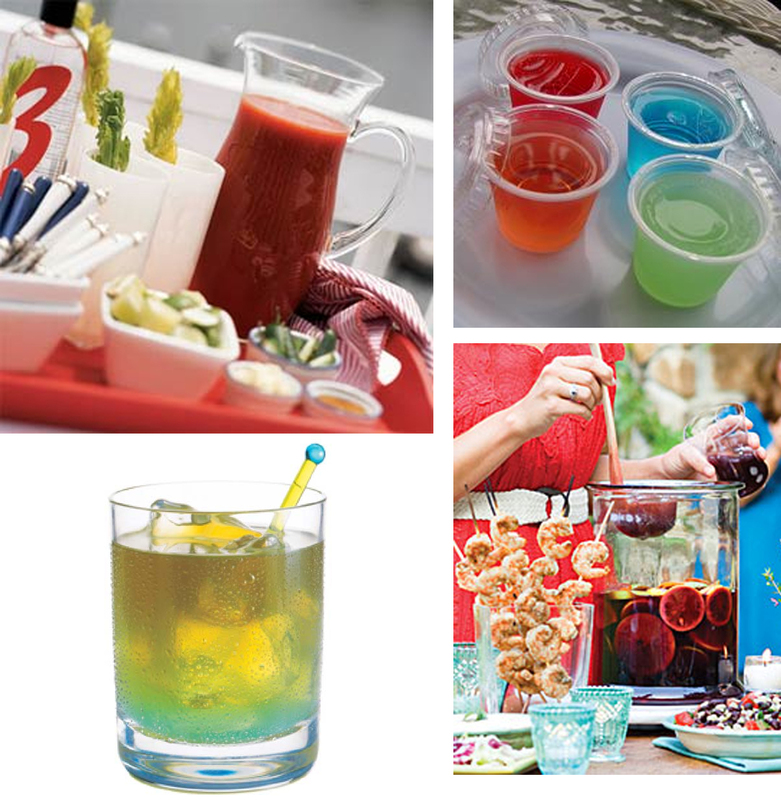 As promised in the invitation, these cute personalized shot glasses will allow you to not only make your own shots, but no cleanup! The are a steal at $11.99/50 at Oriental Trading. The food has to be benign enough for people to not eat. Good/interesting food alway will get unfamiliar people talking to one another. I suggest looking over some deli and catering options as well because it might be more cost effective and time efficient. I would also make another ‘main’ food item and more canapés as people drink, they will want munchies. Little mints could be put into clear goody bags, or just out on the table for people to munch on. Super cute and taste like pineapple from the Candy Warehouse. Another way to personalize the event that isn’t too expensive are the napkins. Stationery Studio has them for $26.96/100 napkins with graduation personalization and an assortment of colors. The White Bean Veg Dip from MyRecipes.com dip is always a good staple for people watching their weight or for vegetarians. 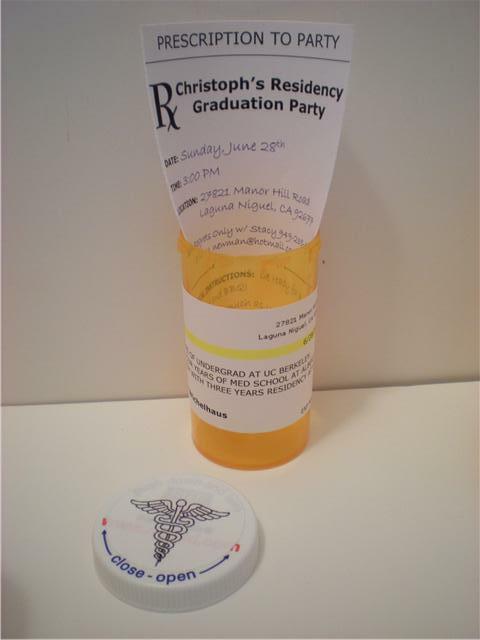 The Pill bottle cake is a great idea from CakeCentral.com. 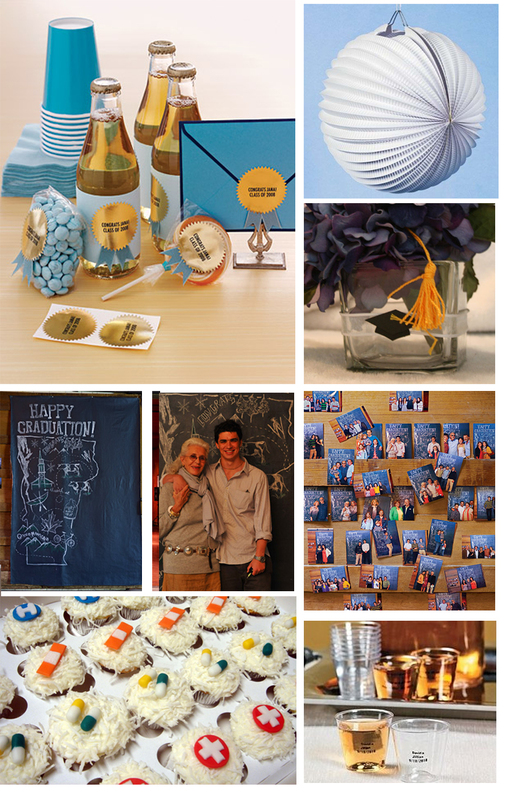 It could be personalized for the grad. Or just skip the cake and use Twinkies decorated as “pills” on a platter. Sliders are always a crowd pleaser and these can be made ahead of time! They could be made with or without cheese and offered with different toppings via MyRecipes.com. You have to always have a pasta salad that is safe for everyone to try. This one from MyRecipes.com has tuna, but can be eliminated– and it is low fat! To round out the meal is a tropical fruit salad. It is familiar enough, but will offer a little edge to get people talking. Being a nursing graduation, the drink names can be a creative way to get the theme back into the food. Of course you need to have the obvious drink of Bloody Mary served in nice glasses. Next would be a nice pleasing Sangria. There would obviously be beer, white and red wines, and some variety of shots named in honor of completing nursing school and being a student like Tainted Fruit Jello Shot that can be made into any color and flavor, or a drink I would call “The All-Nighter” shot which has red bull and alcohol, or “Allergy Shot” (Incredible Hulk recipe). People, well at least my girl friends, are up for anything that looks fun and different. Well, there are tons more that I want to add, but maybe it will be another one when he graduates with his masters. I can only hope, lol!